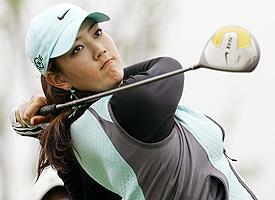 Michelle Wie made the cut in a men’s golf event, only the second woman to do so. It’s not the PGA Tour, though. Michelle Wie made her first cut in a professional men’s tournament Friday after shooting a 3-under-par 69 in the Asian Tour’s SK Telecom Open. Wie finished at 5-under 139 after two rounds and was tied for 17th at the Sky 72 Golf Club course, six strokes behind co-leaders Iain Steel of Malaysia (66) and Prom Meesawat of Thailand (64). The cut was set at even-par 144. The Hawiian-born teenager becomes the second woman to make the cut at a men’s tournament in South Korea; LPGA star Se Ri Pak finished tied for 10th in the lower-tier KPGA Tour SBS Pro-Golf Championship in 2003. While it’s not exactly the Masters, this is an impressive achievement. And she hasn’t even hit 20.